Employer Services | MAX Solutions. At MAX, we understand that you want to find the right people for your business. We partner with you to understand your needs and find you people who will do a great job, are the right fit for your organisation and will stay with you. With over 1000 consultants across Australia working with over 120,000 talented candidates, we can find you people with the right abilities. We identify ready, willing and able candidates and only recommend those with the right experience, skills and attitude. Our Employer services offer support to both you and your new employees as you begin working together. We continue that support for up to 12 months to make sure things go smoothly. Our managed service, including access to government funding and regular employer/employee support, is delivered free of charge. 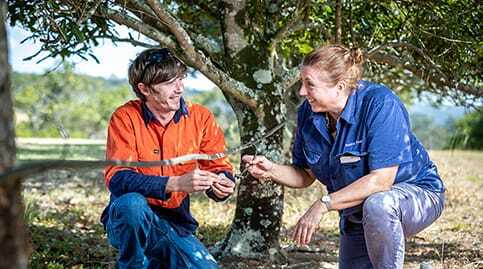 In preparation for her first full harvest, Kate Rose, the owner of Baupal Park Macadamia Farm realised she needed more hands on deck to keep the farm operational. Jasmine's in her first job and loving it!